BROMSGROVE racer James Cater came away with his best Ravenol Formula Vee Championship result at the weekend. Cater escaped the torrential downpours and made the long trip to North Yorkshire for an unexpectedly sunny and dry two days of racing. Having spent every moment repairing the crash damage picked up at Brands Hatch, a few last minute problems were only spotted as he loaded the Primrose Hospice sponsored Sheane car onto the trailer. Things were not looking great for results at one of Cater’s favourite tracks. Despite the worries, Alvechurch mechanic Glenn Hay had managed to balance the car well and Cater was able to put some good lap times in to start from 14th and 13th respectively for the races. Cater gained a couple of places at the start of the first race before getting stuck into a six-car battle. With the car struggling on the straights due to lack of power, he tried to make up as much time as he could through the corners but got shuffled back in the pack. On the final lap the car ahead had a misfire on the fastest part of the track, blocking Cater at a crucial section and allowing Mark Egan to sneak through and dropping him to 16th overall and fifth in Class B. In the second race Cater took ninth place through the first few corners after some close wheel-to-wheel action with Andrew Cooper. Despite being chased hard for the whole race, Cater was able to pull out and hold a safe gap to the pack behind who were waiting to pounce on the slightest mistake. With Cater pushing to the limits around the high speed circuit the race was red flagged for another incident, leaving him with a solid and best-ever result of tenth place and third in class. 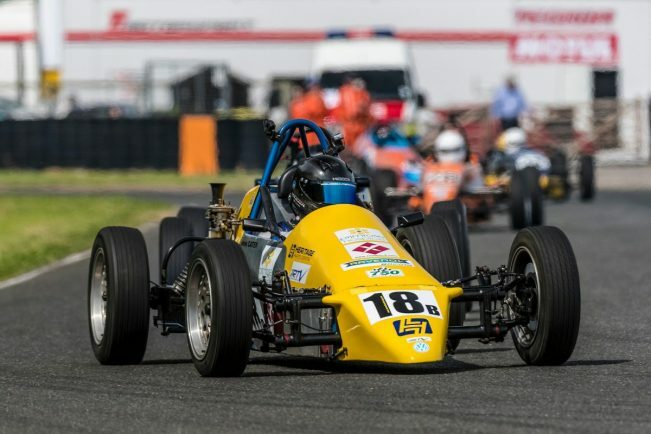 The next round takes place in Ireland at Mondello Park on July 7-8 when the races will form part of the Irish Vee Festival.